We wondered that while doing so much, the EAD might be a jack of all trades without mastering any of them. But this is Yamaha, and the EAD is a triumphant move into an area of the market we’ve been waiting to see. Few words have entered the drumming lexicon with such force in recent years as ‘hybrid’. Having gone from being slightly exotic additions to a kit, electronic/acoustic combinations are now commonplace and only growing in popularity. Despite this, it’s still a daunting concept to some players: a potential technological minefield, and one that could set them back as much as their shell-pack did. But as we’ve seen right here in recent years, every company that produces electronic percussive devices is pushing its take on ‘hybridisation’. Roland has been the most prolific, leaving us to anticipate if and when Yamaha would expand its hybrid offering from a couple of triggers and the DTX12 multipad. And at the tail end of 2017, that’s exactly what happened. Enter the EAD10. The EAD10’s launch was understatedly confident: a promo video on social media that left us thinking, ‘It looks brilliant! What is it?’ Well, it turns out that it’s many things all at once: a complete system for processing and recording your acoustic kit sound, while layering triggered sounds at the same time. In addition to this, iOS users can connect the module to their phone or tablet and, in conjunction with Yamaha’s Rec’n’Share app, jam with music (which can be sped-up or slowed-down, looped etc) and create video recordings using the EAD sounds. That’s a lot to take in, even in a nutshell, but here’s how it all works. 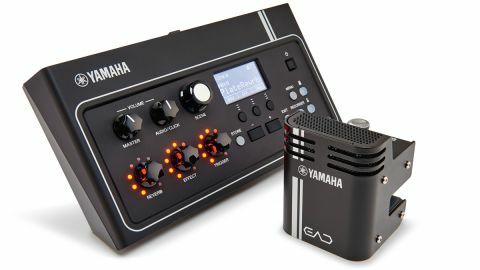 Out of the box, the EAD10 system comprises a familiar looking module, and a less familiar microphone/sensor unit. The sensor/microphone unit performs double duty, clipping to the player’s side of the bass drum hoop. Here, the clever stereo microphone contained within picks up your entire kit, while simultaneously acting as a bass drum trigger. A pair of stereo cables connect the sensor unit to the module: one for the audio from the microphone and one for the trigger signal. Setting up the EAD10 is simple. It comes with a mounting bracket to attach it to a multiclamp, and the sensor unit mounts to the bass drum with a thumb screw, so you’re ready to go in a couple of minutes. The module comes preloaded with 50 ‘scenes’ (presets, with space to create 200 of your own), each made up of three main sections: there’s the global reverb, ‘other’ effect (applied only to the audio of your acoustic sound) and the trigger section. Obviously, in order for the EAD to work its magic, you need to be able to hear what’s coming out of the module, so there’s a headphone output, plus left and right main outputs if you need to send the sound to a PA system. With our headphones on, it’s a surreal experience at first. The microphone part of the sensor does a fantastic job of picking up every part of the kit, even though it’s mounted at knee-height. Everything comes through well-balanced, with cymbals a lot clearer than we were expecting. Of course, the real fun starts when you begin implementing some of the reverb and effects. The EAD contains 11 different reverb types, offering acoustic environment ranging from the common (hall, stage, studio etc) to more creative (gated, reverse) and can be applied to both the audio and triggered sounds (with individual control over how much for each sound you trigger too). On the multi-effects side are 21 effects that will rival your guitarist’s arsenal of pedals, spanning compression, distortion, delays, filters, flanger, phaser and more. Flicking through the scenes allows you to apply these sounds directly to your kit, so the sharp, dry sound of our rehearsal room was instantly transformed. Next is the trigger side of the module. Located on the back are a pair of stereo trigger inputs and two single-zone inputs, meaning that with the help of a Y-cable, you can connect up to six additional pads at once. Inside the EAD are over 700 sounds that can be assigned to your triggers, plus you can import up to 100 of your own samples. As with editing the effects, assigning the trigger sounds is straightforward. You hit the trigger you’d like to assign, select the trigger menu, choose the type of sound you’re looking for and the voice within that category, then finally you adjust the trigger control knob to set its volume. When you’re ready to record, you can capture the audio to the EAD’s onboard memory as audio (90 seconds), or connect a USB flash drive for up to 30 minutes in one take. But as we mentioned, Yamaha has also introduced its Rec’n’Share app (iOS only) for recording and editing. We experimented by connecting the module to our phone and we were amazed at how smoothly they interacted. It’s possible to record video with decent quality audio (including your trigger sounds) in seconds, and once you’re finished you can trim the clips and export them to your phone’s camera roll or direct to your social media accounts. The EAD could have suffered an identity crisis. Is it a microphone? An audio interface? Sound module? Trigger converter? It’s all of these things, and Yamaha has seamlessly integrated them to make a product that delivers on the needs of drummers right now. It’s a practice tool, a module for live use, and a quick and easy way of recording yourself, whatever your ability.